The same circuitry as Battering Ram V2.1 but with the toggle for the octave up on the fuzz replaced by a footswitch. 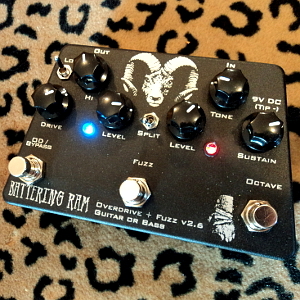 The Battering Ram is an Overdrive + Fuzz pedal which works equally well for guitar or bass or anything else you want to plug into it. Overdrive + Fuzz means that the overdrive and fuzz channels can work in parallel, each channel receiving the instrument signal, working their magic and then mixed back together at the output. The Overdrive channel with it's Drive, Lo, Hi and Level controls is switched on via the OD/Bypass stomp switch while the Fuzz channel has it's own stomp switch and Tone, Sustain, Octave and Level controls. The Split switch allows the Overdrive and Fuzz channels to be run individually as well. Stomp on the OVERDRIVE switch and you turn the pedal on and activate the Overdrive channel. It's a smooth overdrive which can go from completely clean to growling distortion via the DRIVE knob. The LO switch adds in the lower frequencies to make it full-range for bass or other instruments. The HI knob lets you either boost or cut the highs to dial in the tone you want. The LEVEL knob on the Overdrive side controls the output volume of the Overdrive channel only. The FUZZ section is switched on via a second stomp switch and has it's own LEVEL knob to control the Fuzz volume separately from the Overdrive. The fuzz sound is snarling and raspy and can get right out of control if you crank up the SUSTAIN. The TONE control goes from high-end cut to flat to a mid-cut, high end boost. And for another set of sounds there is the OCT stomp switch to change the fuzz section into an octave up fuzz. Great new video demo of the Battering Ram V2.1 on guitar, by Tim Calloway. Review at Bassfuzz.com with video demo. YouTube demo on guitar posted by a customer. YouTube demo on bass posted by a customer. Uses standard 9v adaptor like Boss PSA, Godlyke Powerall, Onespot, with tip negative jack or a single 9V battery.